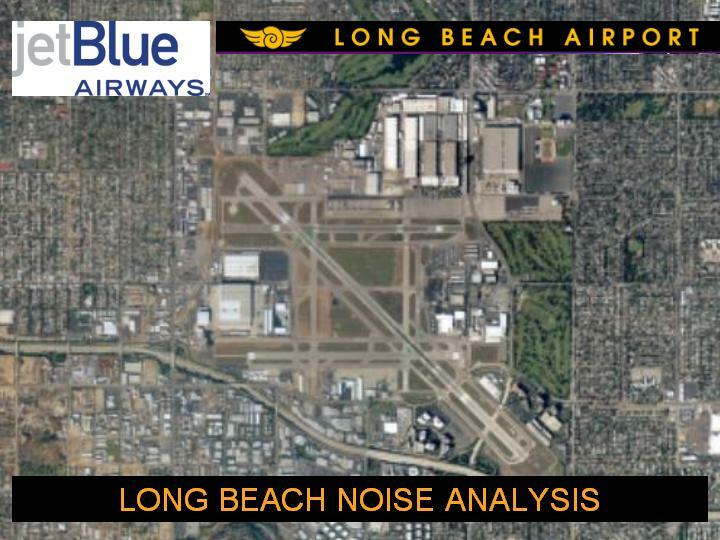 (May 29, 2001) -- Posted below are links to noise contour maps, comarisons and data in a document provided by JetBlue. The document consists of eight data pages (plus the title page, above). The entire document (eight data pages plus one title page) is posted as a single .pdf document. The file is 4.4 MB (so downloads may take several minutes). 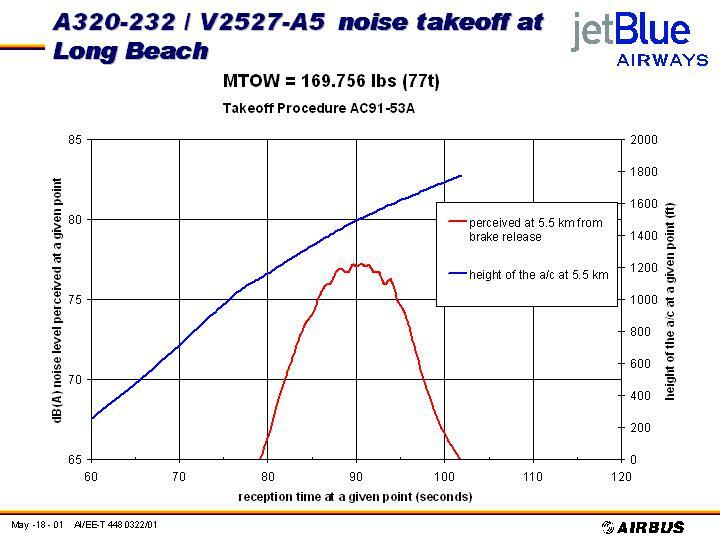 To view it (and save on your hard drive if you wish), click on Jet Blue noise document. 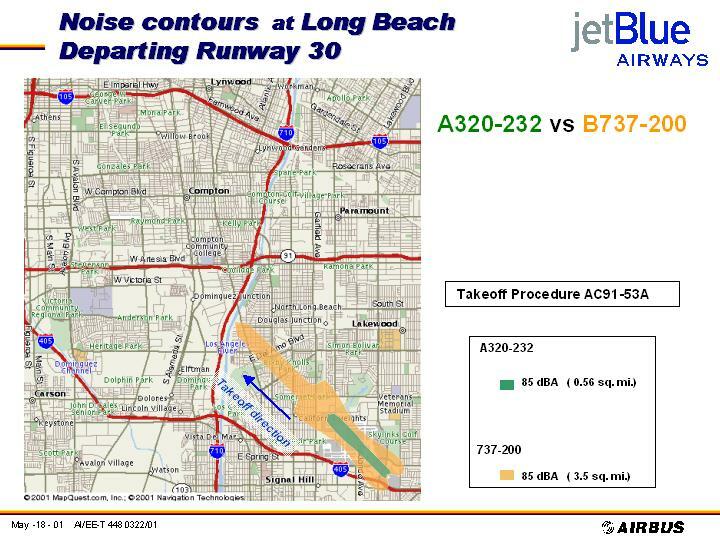 Data pages 1 and 2 above show 85 dBa and 75 dBa (high noise contours) for JetBlue's A320-232 Airbus takeoffs from LB Airport's main diagonal runway. 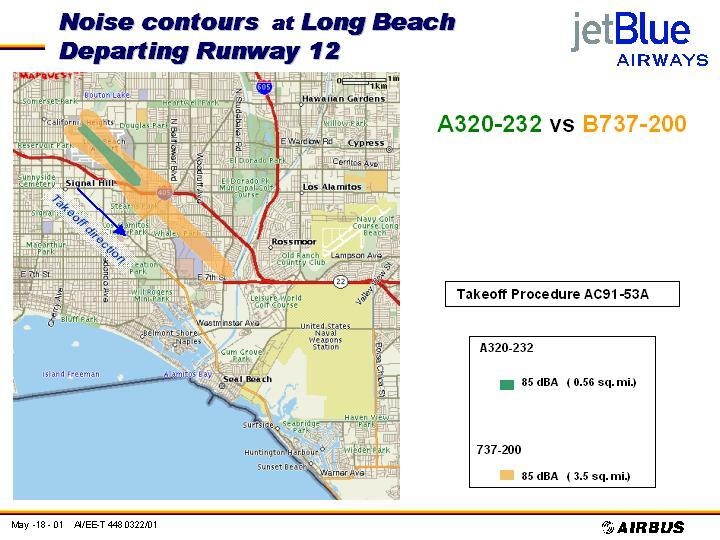 It's called runway "30" for takeoffs over Bixby Knolls/Cal Heights (in the direction of 300 degrees) and is called runway "12" when weather conditions trigger takeoffs over Los Altos (in the direction of 120 degrees). 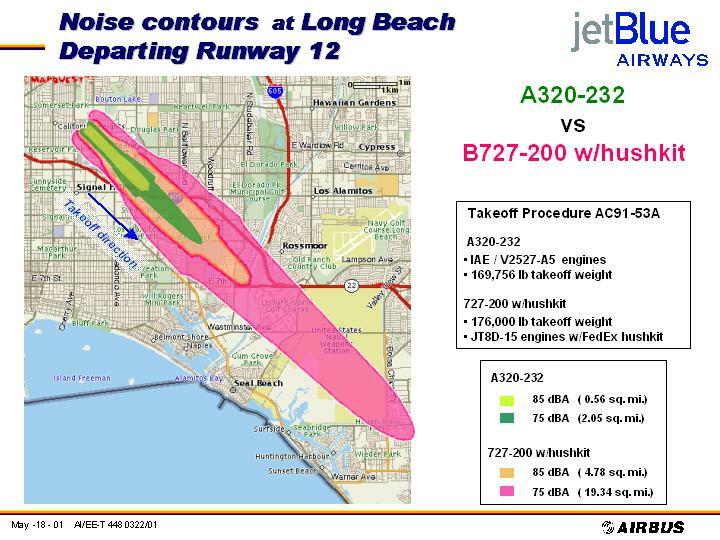 Data pages 3 and 4 compare high noise contours for Jet Blue's Airbus to a Boeing 727 (with "hush kit") for takeoffs on runway 30 (toward Bixby Knolls/Cal Hts) and runway 12 (toward Los Altos), showing each plane's 85 dBa and 75 dBa contours. 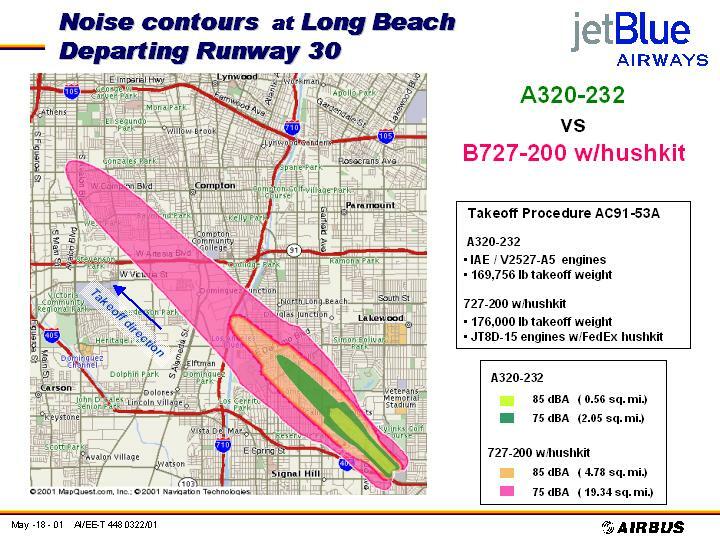 Data pages 5 and 6 compare high noise contours for Jet Blue's Airbus to a Boeing 727-200 for takeoffs on runway 30 (toward Bixby Knolls/Cal Hts) and runway 12 (toward Los Altos), showing each plane's 85 dBa and 75 dBa contours. 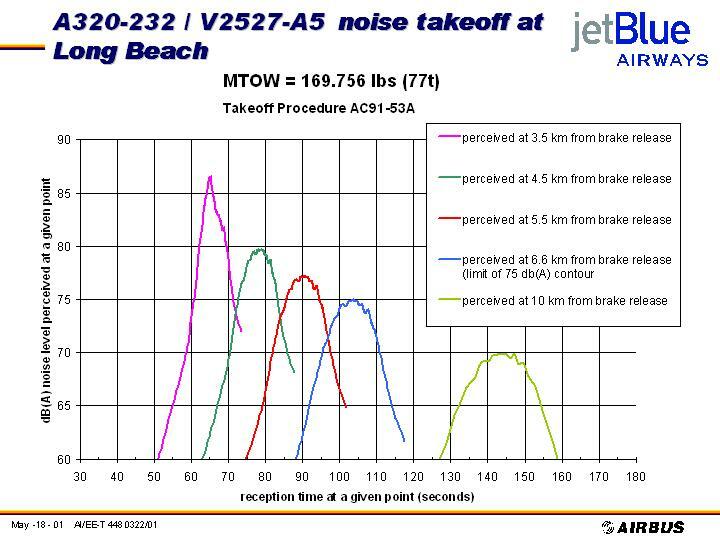 Data pages 7 and 8 show noise duration charts for JetBlue's Airbus, indicating noise on take off plotted against reception time. 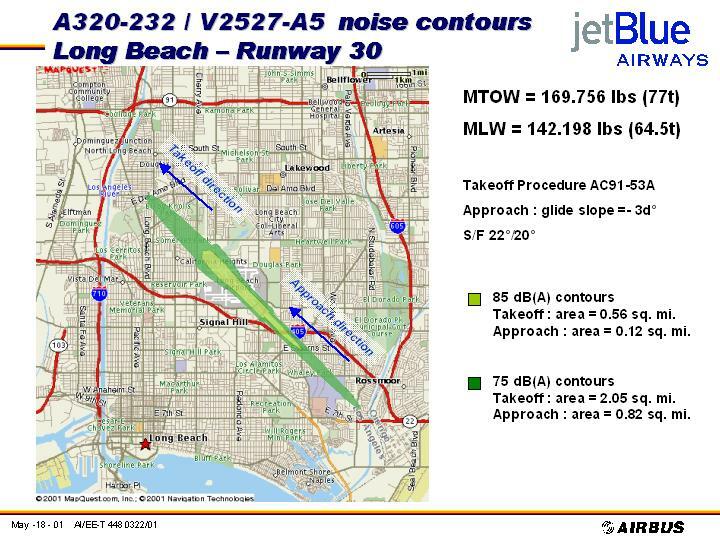 To view LBReport.com's coverage of JetBlue's May 23, 2001 LB Airport news conference (including transcript excerpts from LB officials and JetBlue's CEO), click Jet Blue May 23, 2001 LB news conference. 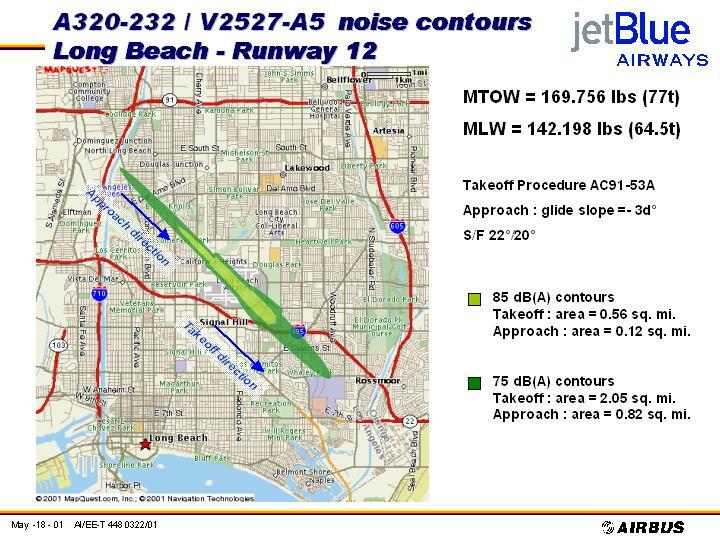 To view LBReport.com's coverage of on the City Council's May 15, 2001 vote that paved the way for JetBlue taking all 27 then-vacant LB Airport commercial flight slots (including transcript excerpts), click City Council May 15, 2001 vote that cleared way for Jet Blue taking all vacant flight slots.